A Prunus persica (L.) Batsch. cultivar. For more detailed information on this peach see Prunus persica (L.) Batsch. var. ‘Grosse Mignonne’, ‘Royal Kensington’ being a recognised synonym of this old peach. No additional data. The illustration of ‘Grosse Mignonne given in the Pomological Magazine is used as illustration here. [PM t.23/1828]. 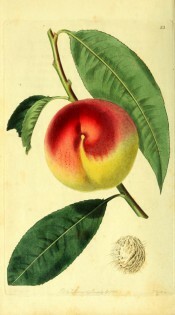 Listed in all published catalogues as ‘Royal Kensington’ [Peach no.1/1843]. It seems likely that Macarthur grew ‘Royal Kensington’ and ‘French Mignonne’ in the expectation that they were distinct varieties. The latter never appeared in the catalogues although it is listed as a parent of Camden-bred cultivars. It is also possible that Macarthur realised in 1845 that ‘Royal Kensington’ should correctly be identified as the French ‘Mignonne’ peach, although it continued to bear its name in later editions of the catalogues.